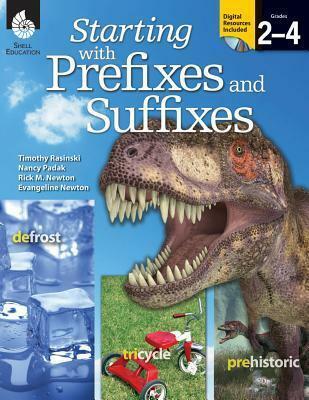 Dive into prefixes and suffixes where students in grades 2 4 will expand their vocabularies and improve their word knowledge. Starting with Prefixes and Suffixes is a standards-based resource that introduces common Latin and Greek prefixes and suffixes and presents them in ways that are easy to understand and apply. Each lesson provides necessary content explanations, instructional guidelines, and activities to help students decipher meaning by analyzing work parts and word groups. Additional resources are offered to assist teachers facilitate learning with an appendix offering more activities, extensions, and flashcards. This resource is correlated to College and Career Readiness and other state standards. Timothy Rasinski, Ph.D., is a Professor of Literacy Education at Kent State University. He is the author of several best-selling books and numerous articles on reading education, word study, and reading fluency. He is a popular and frequent presenter at reading and literacy conferences nationwide. His research is cited by the National Reading Panel in the development of Reading First, and he is currently coeditor of the Journal of Literacy Research.